The “Sophs” are losing the tug-of-war battle against the freshmen. outlook on the numerous possibilities the “Dead Cedar” has to offer. The co-eds begin their annual canoe trip. Unbeknownst to many MSU students today, the Red Cedar used to be the backdrop for a number of undergraduate traditions—not all of which were sanctioned by the school. 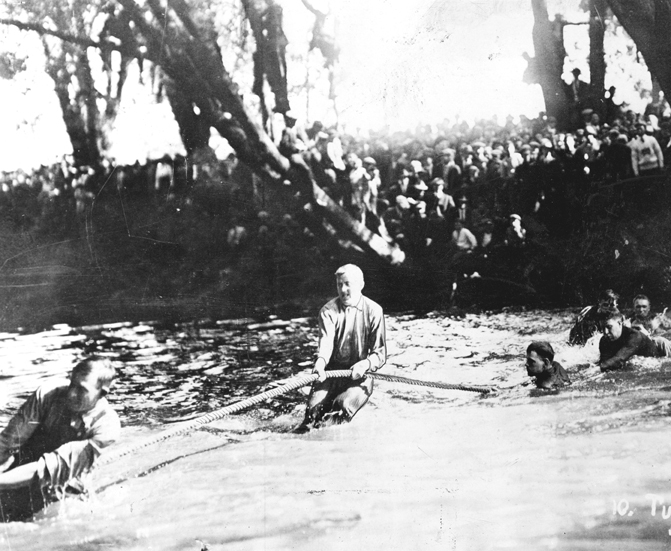 Some of the most popular of these events was the annual rivalries between classes, and the Freshman vs. Sophomore competition consisted of a good-hearted “tug-o-war” over the river. Judging from the photograph, it was clearly a much anticipated event. Nevertheless, The Red Cedar was used for more than just watching your classmates get pulled face-first into its murky depths. The banks used to be a location for observation and an inspiration in art classes. The river itself also offered an escape for the early co-eds. 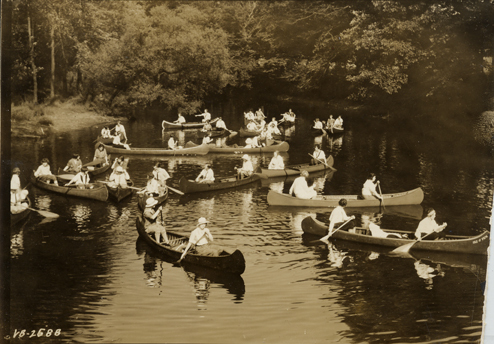 Yearly, multiple-mile-long canoe trips used to be taken by the women down the Cedar to a picnic area, an event which both personal journals and scrapbooks, as well as early M.A.C. newspapers, spoke about with great excitement. One tradition which I had heard nothing about was the Water Carnival at MSU, which happened sporadically in the mid-1900s. 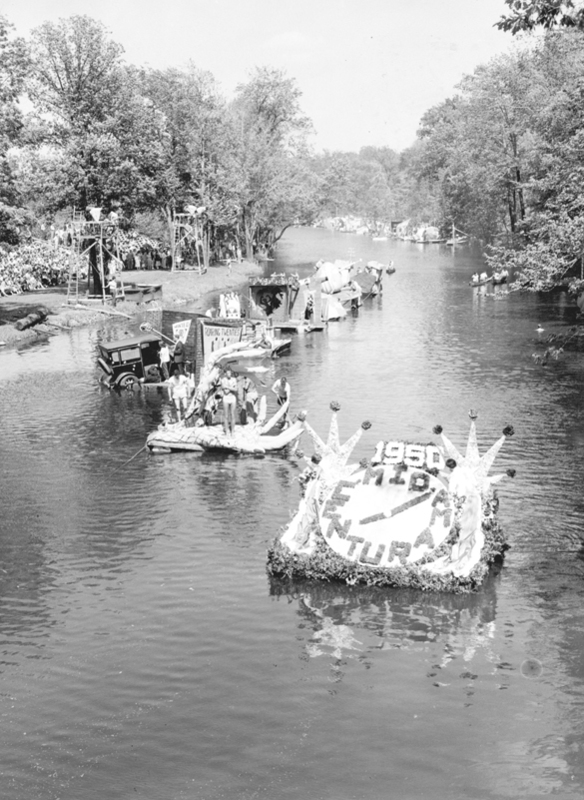 The carnival was much like a parade down the Cedar: floats were made by different student organizations and drifted down the river in procession. Students lined the banks to watch as the creations of fraternities, sororities, theater groups, and others floated past. The Winter Carnival of 1950 proceeds down the Cedar. The majority of such events have been lost to time, and now the Red Cedar is enjoyed from afar by students on the banks or by those brave enough to risk its sometimes ominous waters in kayaks, canoes, and rafts. There remains, however, one venerable tradition that students today still observe: the feeding of the ducks. 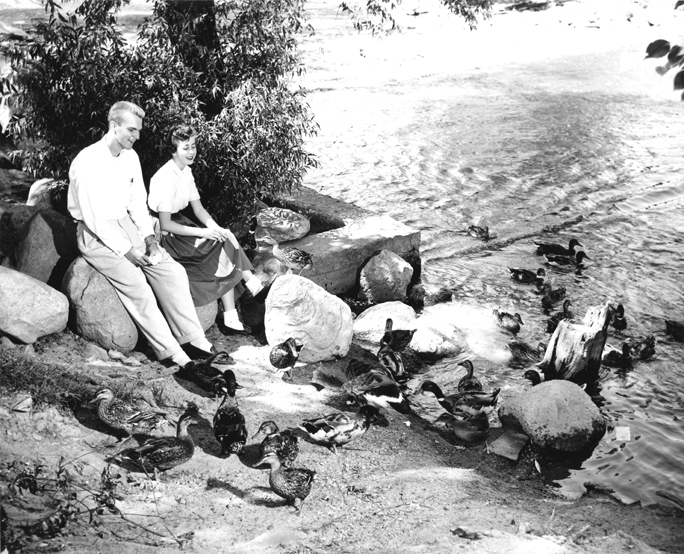 Two students in the 1950s feed ducks on the bank. That’s really interesting. I don’t recall seeing photos of that before. If you are ever interested in donating them to the MSU Archives, please send us an email (archives@msu.edu).